March | 2014 | Can Men Cook? I used to work at an old Agricultural Research Centre – The Grassland research Institute at Hurley. I did 2 lots of 6 months while doing research towards a PhD – but never went to this great pub. I was meeting with my colleague, Jay Dodson and his dog Izzy (a lovely border collie). We were making plans for our Old Bull and Bush team building events, and looking for TV opportunities for the format too (I challenge Jay to cook a three course meal that I prepare in a fully equipped kitchen – and he has to do it outside over a fire-pit!). Anyway! Lunch was refined and rather good. 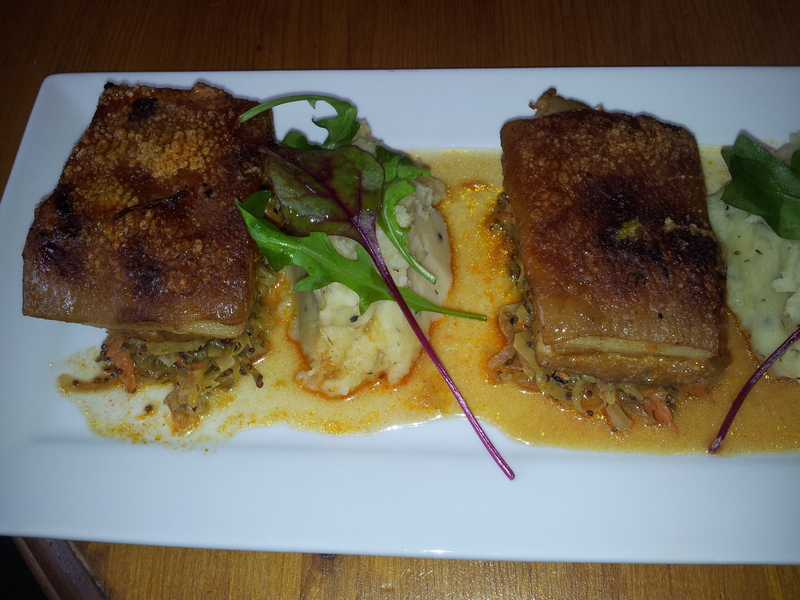 Jay chose slow cooked Belly Pork with mustard mash. beautifully presented as you can see – just don’t know how we managed with only having round plates in our lives before life became quirkily affected by master chef and the like…He left some of the skin – I think normally he might have eaten it – but Izzy needed her fix too. She isn’t allowed her food until Jay has finished, and I think that hierarchical discipline is essential for dogs – everyone knows their place, and no-one gets bothered at the wrong time. Perfect! Phil & Jay’s creative lunch! 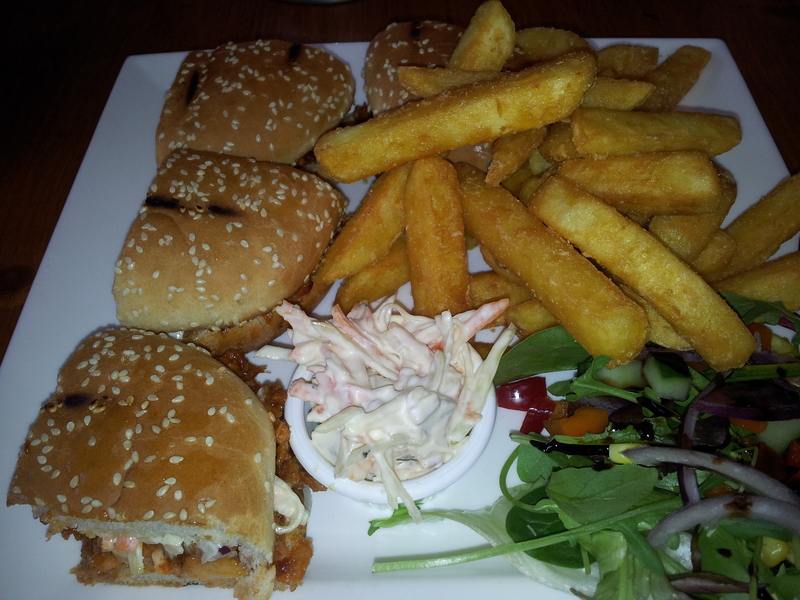 I had pulled pork – barbecued- with chips (triple re-distilled or whatever it’s called) with coleslaw and mixed leaves. A friday lunch of divine proportions and taste. It was actually like a very posh burger – even served on quarter burger buns. But that worked very well. I was almost embarrassed to ask for vinegar and ketchup – but the waiter assured me that he couldn’t remember anyone who hadn’t had that with this particular meal – so I felt much better! A very friendly village (Jay – lives on a narrow boat – has been holed up in Hurley for a couple of months due to the river being in spate – but has felt very welcomed and is enjoying being trapped for the moment!. It won’t be our last visit together- the ambiance, food, friendliness and beer all help to make our creative juices flow! 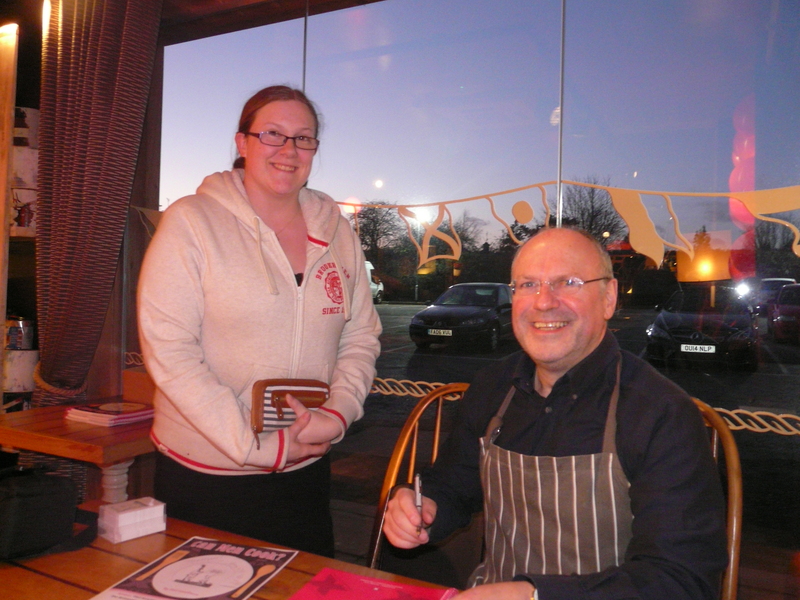 Saltbox 5th Birthday – the food! My friend and colleague Nicki Davey took the huge step from working in a charity to setting up her own training and development company. 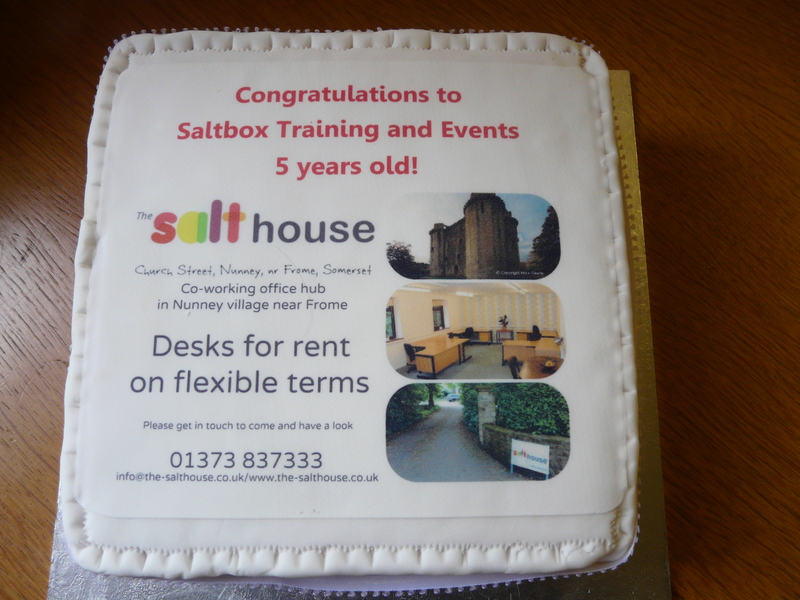 This 5th anniversary event was held at The Salthouse – the venue the run for personal and professional development in Nunney, near Frome in Somerset. We managed to have a wonderfully vegetarian day – without really meaning to. 100 mile drive, and arriving early meant we had time for lunch in Frome (rhymes with ‘broom’, for non locals…). Now, when you don’t know a place, it is always difficult to know where to go to eat – apart from The Good Pub Guide, we tend to look for the best decor a restaurant can have – loads of people! It seems we were lucky to stumble upon The Garden Cafe in Stony Street. We had specials – flan of the day, and pie of the day. My pie was a scrummy mix of wild mushrooms and Stilton and walnuts. What was best though was the accompanying gravy – a rich and very strongly flavoured red wine onion gravy -with lots of herb hints and huge depth of flavours. The flan was lighter than the pie (as you’d expect) but no less toothsome. Gorgeous salads, well dressed, and cooked cold cauliflower with a hint of curry flavour. We were well set! Now onto the main event. Nicki had her friend Keren – who does the food at all the events at the Salthouse that I have been to. (Events Horizon has a face book page – check it out! Events Horizon ) Chocolate brownies went down rather too well – but we felt less guilty having the rhubarb and ginger cup cakes – two of your five a day in a cake – what’s not to love? Later – after speakers and drumming (see Soft Skills blog…), the finger food arrived. I loved the vegetable curry in very small pots, with rice at the bottom, and a teaspoon to eat it with. Fun for one – but I did have two! The cos lettuce leaves filled with Stilton, walnut and a honey glaze (helps to keep the ingredients on the leaf too – nice touch! 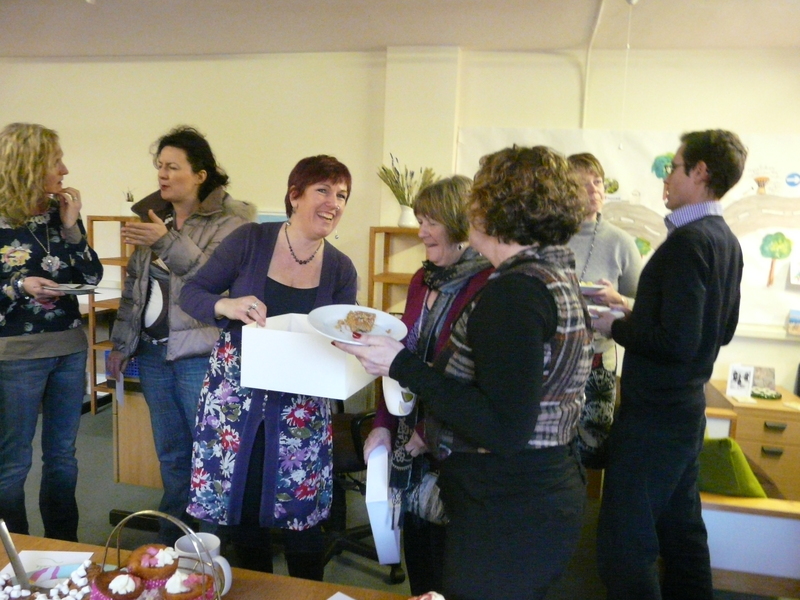 And there were about 8 other things too – plus the ability to go back for the left over cake…as well as the cake that Nicki’s mum had made for the day! Yes – a really rather splendid time was had by all at yesterday evenings book signing here in Marlow in the UK. 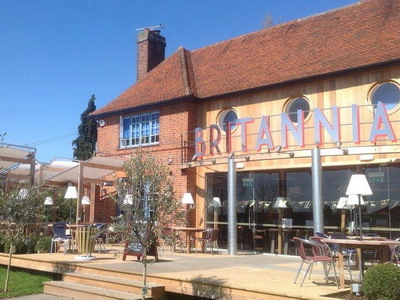 The pub – The Britannia – was a great venue, and Steve, Karen and their teams did us proud. Katy about to be signed! It is a little scary not knowing how many people will turn up, but once a few family and friends had, we ended up with other diners and drinkers wondering what was occurring, so that they were drawn like moths to the bright lights! From tomorrow I hope you will be able to click on the website to order copies, and pay via PayPal. For the lucky people of Marlow area, I can deliver free of charge – sadly, everyone else will have to fork out for postage and packing…but hey, it’s worth it! Everyone will have their copy signed. If you want a special message then just ask me via e mail, and your wish will be granted. Thanks for reading – and if you have a copy yourself, thanks for that too! I hope you are enjoying it! “Can Men Cook?” – book signing tonight! Tweeting, photos and a new blog will be here tomorrow!